Using machine learning in trading strategies for agricultural commodities has gotten a lot of hype lately. While there are plenty of crop yield models, the market has lacked a systematic, reproducible, quantitative approach to modeling which fully specifies its forecasts and has transparent explanatory power. We, at Gro Intelligence, set out to change that. Earlier this year, we decided to openly share the structure and output of our yield model which marries agronomic process expertise with machine learning. Gro’s website featured the weekly forecasts for all to see and comment on from May to November 2017. Subscribers had access to daily updates of the yield forecasts at the county level and access to all the signals in the model. Our data product “Gro” encompasses global agricultural information on all crops. We initially made a US corn yield model as a proof-of-concept for a more general method that can help analysis of a broad array of agricultural commodities globally. Every month, the USDA reports its estimate of corn yield in the US in the World Agricultural Supply and Demand Estimate, or WASDE. 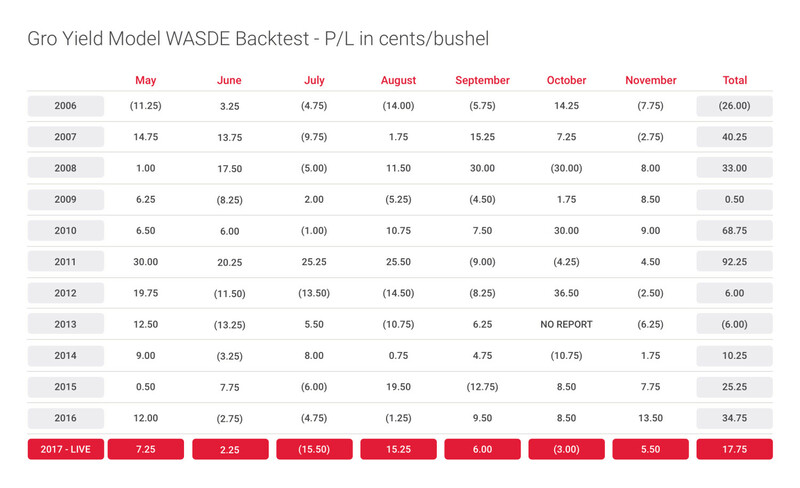 Grain traders all over the world monitor the WASDE very closely during the US corn season, as the USDA has historically been a good forecaster of crop yield, which determines the price of corn. 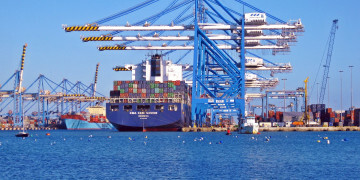 Prior to each report from August to November, financial news organizations survey traders in order to arrive at a “trade estimate” of what the WASDE number will be. Our trading method follows the simplest set of rules we could come up with for a systematic trading model. We generate a “buy” or “sell” signal based on the level of our corn yield model relative to the trade estimate when it’s available, or last month’s USDA yield when the trade estimate is not compiled (May, June, and July.) If our model has a lower yield than the trade estimate or old USDA number, we bought corn because a lower crop yield should lead to higher prices. 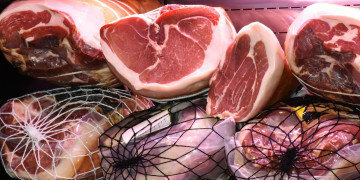 If our yield estimate was higher than the trade or USDA number, we sold it. All trades were executed in liquid nearby futures at the closing price the day before the WASDE report was released. Trades were reversed and closed out at the daily closing price after the report. For example: on the afternoon of 11 October this year, our website displayed a corn yield estimate of 172.7 bushels/acre. The published trade estimate average stood at 170 bushels/acre, and the latest USDA yield as of 12 September was 169.9 bushels/acre. Since our yield was above the trade estimate, we sold corn for delivery in December at $3.46/bushel. Then on 12 October at noon NY time, the USDA came out with a yield of 171.8. 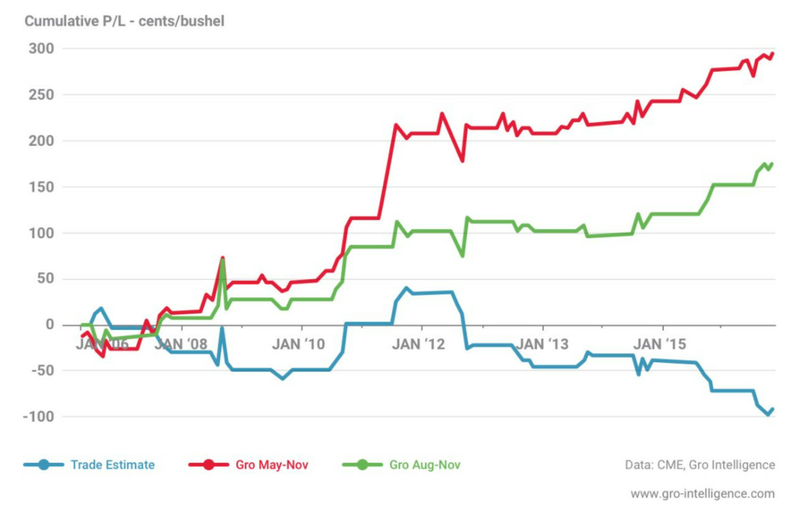 Corn prices rose three cents/bushel, despite the higher yield. We then closed out the trade on the afternoon of the 12th for a loss of $0.03/bushel. The live and backtest details below clearly show that our model, which was tracked and explained for free to anyone who visited our website, generated significant value for corn traders who traded using our yield forecasts. As a comparison, we have also added a table which shows what the “trade estimate” P/L would have been through 2017 had the same trading rules been applied - this would have led to significant losses of $0.9075/bushel (or -$4537.50/contract) vs a gain of $2.9675/bushel (or +$14,837.50/contract) using Gro’s model. 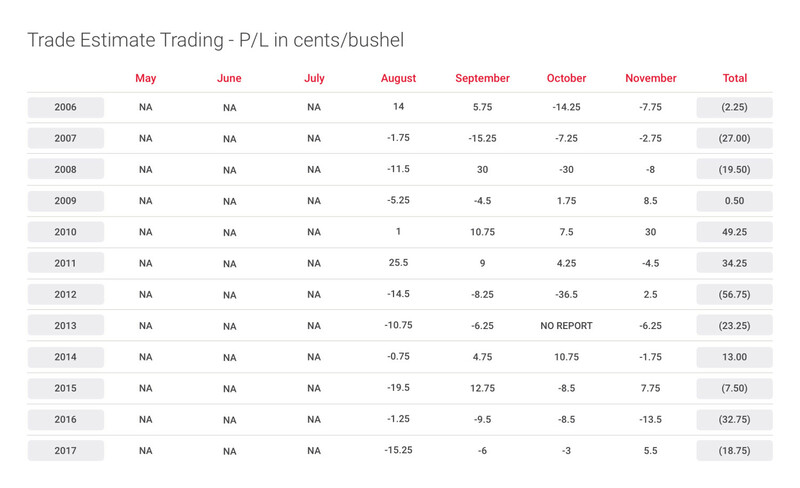 Restricting the Gro system to the months with a trade estimate (Aug-Nov) leads to a similar result: a gain of $1.7625/bushel (or +$8,812.50/contract.) Of course, profits would increase if the yield estimates were used as inputs to more sophisticated trading rules. Gro’s strategy is up in 61% of 76 trades since May 2006 and earned a cumulative $2.9675/bushel (or +$14,837.50/contract.) Note that the WASDE wasn’t issued in October of 2013 due to the Federal Government shutdown. The trade estimate model is up in only 17 out of 47 trades, or 36% of the time, for a total loss over the entire period of $0.9075/bushel (or -$4,357.50/contract). The information we gather enables us to personalize, improve and continue to operate the Services. We collect the following types of information from our users. · We automatically receive and record information from your web browser when you interact with the Services, including your IP address and cookie information. This information is used for fighting spam/malware and also to facilitate collection of data concerning your interaction with the Services (e.g., what links you have clicked on). · Generally, the Services automatically collect usage information, such as the number and frequency of visitors to the Site. We may use this data in aggregate form, that is, as a statistical measure, but not in a manner that would identify you personally. This type of aggregate data enables us and third parties authorized by us to figure out how often individuals use parts of the Services so that we can analyze and improve them. · Most browsers have an option for turning off the cookie feature, which will prevent your browser from accepting new cookies, as well as (depending on the sophistication of your browser software) allowing you to decide on acceptance of each new cookie in a variety of ways. We collect statistical information about how users collectively use the Services (“Aggregate Information”). Some of this information may be derived from Personal Information. This statistical information is not Personal Information and cannot be tied back to you or your web browser. How, and With Whom, Is My Information Shared? We share Aggregate Information with our partners, service providers and other persons with whom we conduct business. We share this type of statistical data so that our partners can understand how and how often people use our Services and their services or websites, which facilitates improving both their services and how our Services interface with them. In addition, these third parties may share with us non-private, aggregated or otherwise non Personal Information about you that they have independently developed or acquired. In some cases, we may choose to buy or sell assets. In these types of transactions, user information is typically one of the transferred business assets. Moreover, if we, or substantially all of our assets, were acquired, or if we go out of business or enter bankruptcy, user information would be one of the assets that is transferred or acquired by a third party. You acknowledge that such transfers may occur, and that any acquirer of us or our assets may continue to use your Personal Information as set forth in this policy. Is Information About Me Secure? We store all of our information, including your IP address information, using industry-standard techniques. We do not guarantee or warrant that such techniques will prevent unauthorized access to information about you that we store, Personal Information or otherwise. What Information of Mine Can I Access? You can access and delete cookies through your web browser settings. What If I Have Questions or Concerns? If you have any questions or concerns regarding privacy using the Services, please send us a detailed message to support@gro-intelligence.com. We will make every effort to resolve your concerns. 1. Acceptance of Terms of Service. a. By using the Services in any manner, including but not limited to visiting or browsing the Site, you agree to these Terms of Service and all other operating rules, policies and procedures that may be published from time to time on the Site by us, each of which is incorporated by reference and each of which may be updated from time to time without notice to you. a. Definition. For purposes of these Terms of Service, the term “Content” includes, without limitation, information, data, text, photographs, videos, audio clips, written posts and comments, software, scripts, graphics, and interactive features generated, provided, or otherwise made available on or through the Services. b. Notices and Restrictions. The Services may contain Content specifically provided by us or our partners and such Content is protected by copyrights, trademarks, service marks, patents, trade secrets or other proprietary rights and laws. You shall abide by and maintain all copyright notices, information, and restrictions contained in any Content accessed through the Services. Unless otherwise indicated, these Terms of Service and all Content provided by us are copyright © 2018 Gro Intelligence, Inc. All rights reserved. c. Use License. Subject to these Terms of Service, we grant each user of the Services a worldwide, non-exclusive, non-sublicensable and non-transferable license to use (i.e., to download and display locally) Content solely for purposes of using the Services. Use, reproduction, modification, distribution or storage of any Content for other than purposes of using the Services is expressly prohibited without prior written permission from us. You shall not sell, license, rent, or otherwise use or exploit any Content for commercial use or in any way that violates any third party right. d. Availability of Content. We do not guarantee that any Content will be made available on the Site or through the Services. We reserve the right to, but do not have any obligation to, (i) remove, edit or modify any Content in our sole discretion, at any time, without notice to you and for any reason (including, but not limited to, upon receipt of claims or allegations from third parties or authorities relating to such Content or if we are concerned that you may have violated these Terms of Service), or for no reason at all and (ii) to remove or block any Content from the Services. a. As a condition of use, you represent, warrant and covenant not to use the Services for any purpose that is prohibited by these Terms of Service or applicable laws, rules and regulations applicable to you. You are responsible for all of your activity in connection with the Services. ix. copy, rent, lease, distribute, or otherwise transfer any of the rights that you receive hereunder. v. protect the rights, property or safety of us, our users and the public. 4. Third Party Services. The Services may permit you to link to other websites, services or resources on the Internet, and other websites, services or resources may contain links to the Services. When you access third party resources on the Internet, you do so at your own risk. These other resources are not under our control, and you acknowledge that we are not responsible or liable for the content, functions, accuracy, legality, appropriateness or any other aspect of such websites or resources. The inclusion of any such link does not imply our endorsement or any association between us and their operators. You further acknowledge and agree that we shall not be responsible or liable, directly or indirectly, for any damage or loss caused or alleged to be caused by or in connection with the use of or reliance on any such content, goods or services available on or through any such website or resource. 5. Termination. We may terminate your access to all or any part of the Services at any time, with or without cause, with or without notice, effective immediately. All provisions of these Terms of Service which by their nature should survive termination shall survive termination, including, without limitation, ownership provisions, warranty disclaimers, indemnity and limitations of liability. a. You release us from all liability for you having acquired or not acquired Content through the Services. We make no representations concerning any Content contained in or accessed through the Services, and we will not be responsible or liable for the accuracy, copyright compliance, or legality of material or Content contained in or accessed through the Services. b. THE SERVICES AND CONTENT ARE PROVIDED “AS IS”, “AS AVAILABLE” AND WITHOUT WARRANTY OF ANY KIND, EXPRESS OR IMPLIED, INCLUDING, BUT NOT LIMITED TO, THE IMPLIED WARRANTIES OF TITLE, NON-INFRINGEMENT, MERCHANTABILITY AND FITNESS FOR A PARTICULAR PURPOSE, AND ANY WARRANTIES IMPLIED BY ANY COURSE OF PERFORMANCE OR USAGE OF TRADE, ALL OF WHICH ARE EXPRESSLY DISCLAIMED. WE, AND OUR DIRECTORS, EMPLOYEES, AGENTS, SUPPLIERS, PARTNERS AND CONTENT PROVIDERS DO NOT WARRANT THAT: (I) THE SERVICES WILL BE SECURE OR AVAILABLE AT ANY PARTICULAR TIME OR LOCATION; (II) ANY DEFECTS OR ERRORS WILL BE CORRECTED; (III) ANY CONTENT AVAILABLE AT OR THROUGH THE SERVICES IS FREE OF VIRUSES OR OTHER HARMFUL COMPONENTS; OR (IV) THE RESULTS OF USING THE SERVICES WILL MEET YOUR REQUIREMENTS. 7. Limitation of Liability. IN NO EVENT SHALL WE, NOR OUR DIRECTORS, EMPLOYEES, AGENTS, PARTNERS, SUPPLIERS OR CONTENT PROVIDERS, BE LIABLE UNDER CONTRACT, TORT, STRICT LIABILITY, NEGLIGENCE OR ANY OTHER LEGAL OR EQUITABLE THEORY WITH RESPECT TO THE SERVICES FOR ANY (I) LOST PROFITS, DATA LOSS, COST OF PROCUREMENT OF SUBSTITUTE GOODS OR SERVICES, OR SPECIAL, INDIRECT, INCIDENTAL, PUNITIVE, COMPENSATORY OR CONSEQUENTIAL DAMAGES OF ANY KIND WHATSOEVER, SUBSTITUTE GOODS OR SERVICES (HOWEVER ARISING), (II) BUGS, VIRUSES, TROJAN HORSES, OR THE LIKE (REGARDLESS OF THE SOURCE OF ORIGINATION), OR (III) DIRECT DAMAGES IN EXCESS OF $50.00. 8. Governing Law and Jurisdiction. These Terms of Service shall be governed by and construed in accordance with the laws of the State of New York, including its conflicts of law rules, and the United States of America. You agree that any dispute arising from or relating to the subject matter of these Terms of Service shall be governed by the exclusive jurisdiction and venue of the state and Federal courts of New York County, New York. a. Modification. We reserve the right, in our sole discretion, to modify or replace any of these Terms of Service, or change, suspend, or discontinue the Services at any time. Your continued use of the Services following notification of any changes to these Terms of Service constitutes acceptance of those changes. c. Force Majeure. We shall not be liable for any failure to perform our obligations hereunder where such failure results from any cause beyond our reasonable control, including, without limitation, mechanical, electronic or communications failure or degradation. d. Assignment. These Terms of Service are personal to you, and are not assignable, transferable or sublicensable by you except with our prior written consent. We may assign, transfer or delegate any of our rights and obligations hereunder without consent. e. Agency. No agency, partnership, joint venture, or employment relationship is created as a result of these Terms of Service and neither party has any authority of any kind to bind the other in any respect. g. No Waiver. Our failure to enforce any part of these Terms of Service shall not constitute a waiver of our right to later enforce that or any other part of these Terms of Service. Waiver of compliance in any particular instance does not mean that we will waive compliance in the future. In order for any waiver of compliance with these Terms of Service to be binding, we must provide you with written notice of such waiver through one of our authorized representatives. h. Headings. The section and paragraph headings in these Terms of Service are for convenience only and shall not affect their interpretation. Contact. You may contact us at the following address: 12 E 49th Street, 11th Floor, New York, NY 10017.